Some live in vintage homes. Others live in modern ones. We live in both. You see, our house has a long architectural history, added to (quite dramatically, I might add) by my grandfather in 1968. The story of The Glass Room is one of family and architecture and dubious compromises. In 1968, my grandparents, then in the their 50s, found themselves in the classic tweener generation. 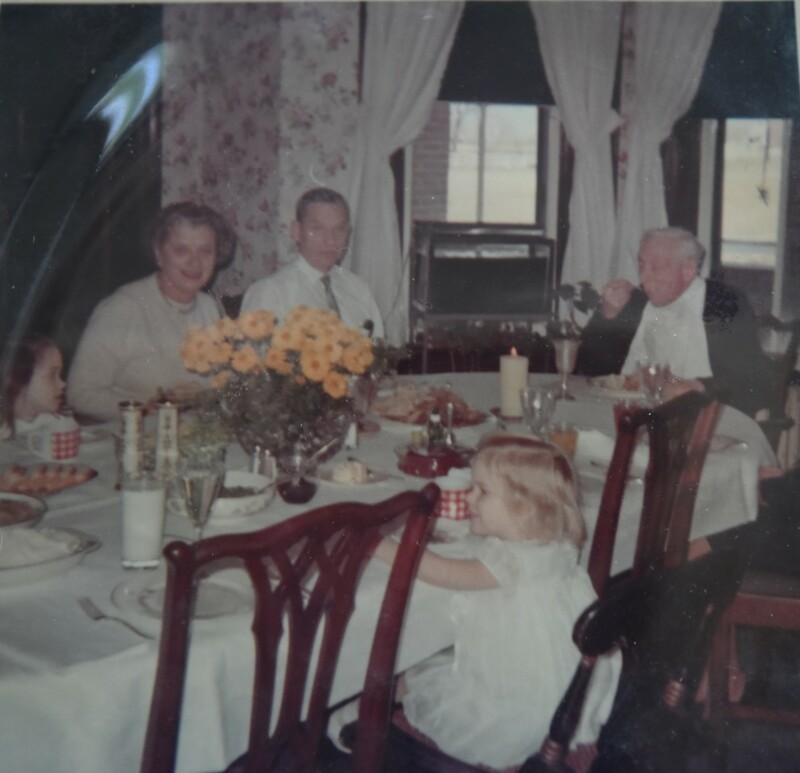 With their sons grown, with children of their own, my grandparents recognized that my grandfather’s parents were in need of assistance. My great-grandfather, George Leicester Thomas, Sr. was ailing, and my great-grandmother could no longer take care of him herself. So it was decided they should move in with my grandparents, here at Clifton (our farm’s name is Clifton on the Monocacy). As great-granddaddy was in a wheelchair, the house, which sits a half-story above ground level, needed to be made accessible. And additional bathrooms (the house had only one and a half baths) were needed. I don’t know all the details of the search for the architect, or any of the discussions involved, but somehow the addition you see here was conceived. Constructed of steel I-beam girders, concrete and brick, the addition looks very much like an office building or public school from the outside. If you’ve ever been here, you’ve probably looked at it and wondered what purpose could it have served. Certainly something other than residential use was intended for this very business-like edifice. But here you’d be wrong. 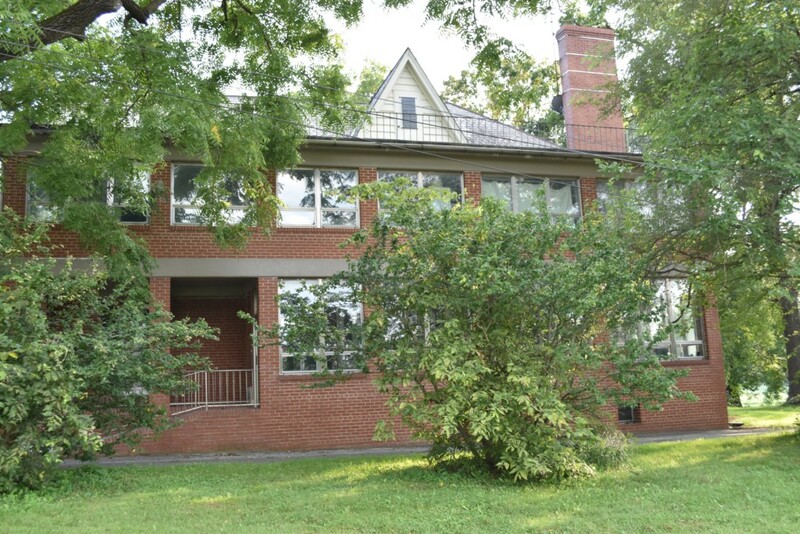 The addition added four and a half bathrooms, a laundry room, an upper glass room with balcony, The Glass Room (which takes up the entire downstairs of the addition), and turned the one-time root cellar/basement into a concrete-encased, theoretically livable space with two of the four new bathrooms. All built to full-on industrial standards (there’s a room in the basement that looks more like the engine room of a submarine than part of a home) including steel beams, stainless steel railings and window casings, and double-pane windows. All that effort, but the space could be no wider than 12′ because it was somehow inconceivable to move the driveway to accommodate anything wider. So The Glass Room is 40’x12′, including 3 walls of glass. Just a word about the name of the room: we call it The Glass Room because my grandmother did. 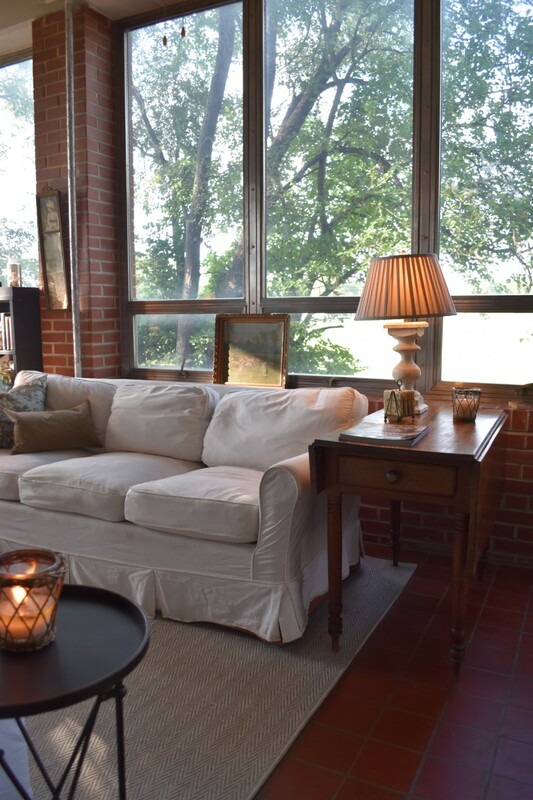 We were never to call it a sunroom because it was constructed on the north side of the house, and as such, according to my grandmother, it did not get sun, and was definitely NOT a sunroom. Part of her earnestness about this stemmed from her having wanted the addition to be on the south side of the house (where, incidentally, there was no driveway to interfere with the plans). I think she wanted it emphasized to all (especially my grandfather) that this was NOT a sunroom, as she had conceived. Nonetheless, grandmother loved this room. Every evening she would walk down to the mailbox, gather her mail and the evening paper (back in the day, there were two papers printed daily, and she got the evening one.) Return to the glass room and read the paper (though she always said she didn’t know why she bothered, because there was never anything in it), and marvel at the setting sun. The narrow walls of the room face the east and west, respectively, and catch the rising and setting sun to perfection. View of the glass room side of the house. If you’ve been here for our tag sales and parked in the larger field, you’ve seen this view from your car. The roof of the addition is flat and made for a great place to get a tan when I was a teenager. 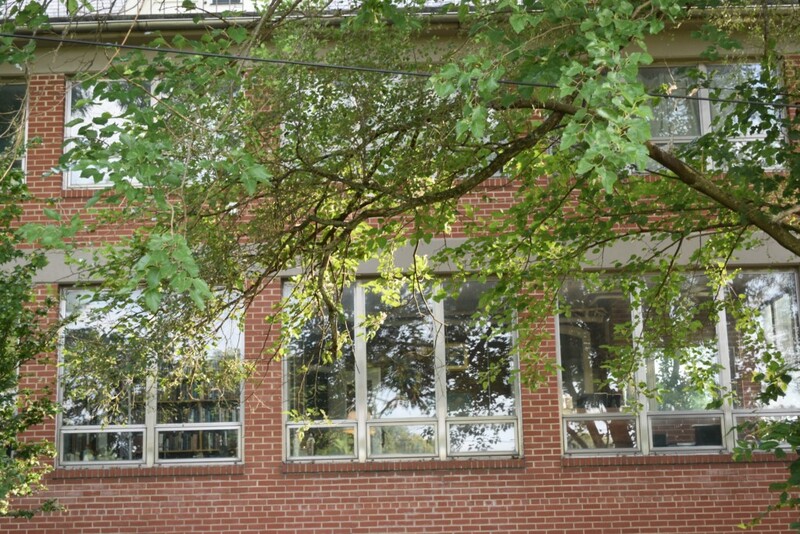 A closer-in view of the addition and the glass room on the first floor. My uncle lived in constant fear that my cousin, sisters, and I would send a ball through these double-paned, rather expensive windows. We never did play a game of ball, that he did not come out and make sure we knew not to throw ANYTHING toward the house. Welcome in! 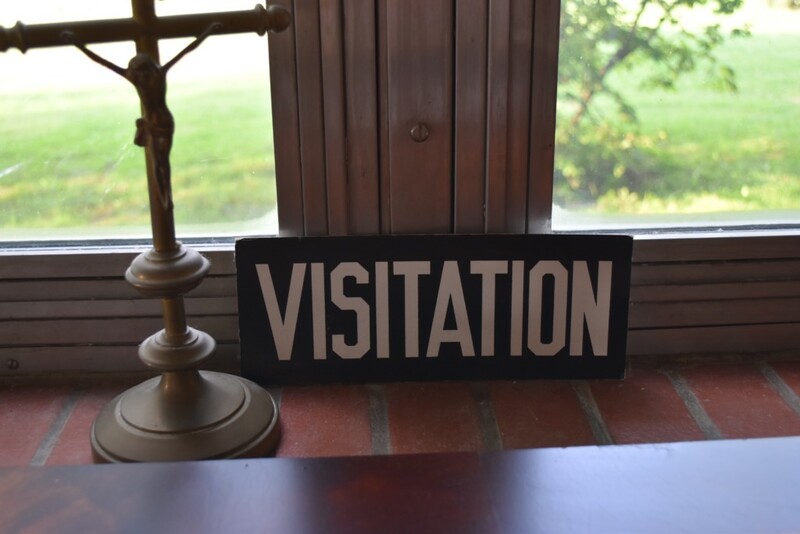 Here’s the view from the glass door – the entrance we use most often. I got this carpet from Woven Floors here at Chartreuse. I love the graphic impact. 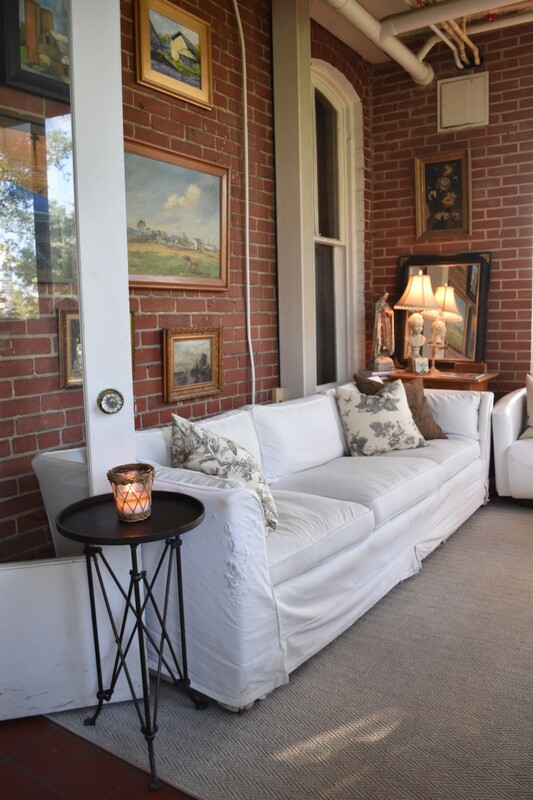 You can see here how narrow the space is, so it’s been broken up into the entry area, and the sitting area toward the front of the house (the glass door is on the back of the house.). 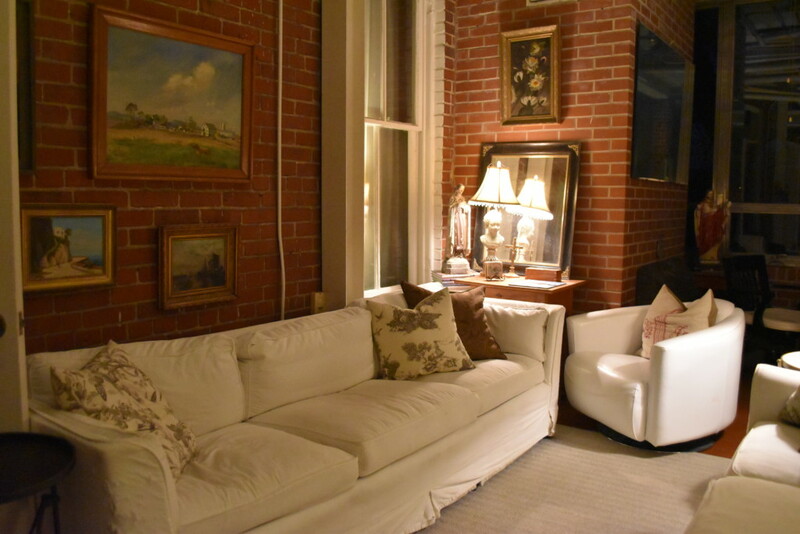 Once you’ve passed through the entryway portion of the room (which is made narrower by the original bay window which pushes into the room) you can either enter the dining room through the glass door in the left of the picture, or continue into the seating area with it’s slip-covered sofas, wall of artwork, and down pillows. Here’s the view from the dining room doorway. Now you can see just how fabulous the windows are. In the summer, the winter, fall, or spring this room is spectacular, not because of its decor. It’s all about the windows here. It’s the best place to watch the snow, the rain, the birds, the squirrels. We just love it! 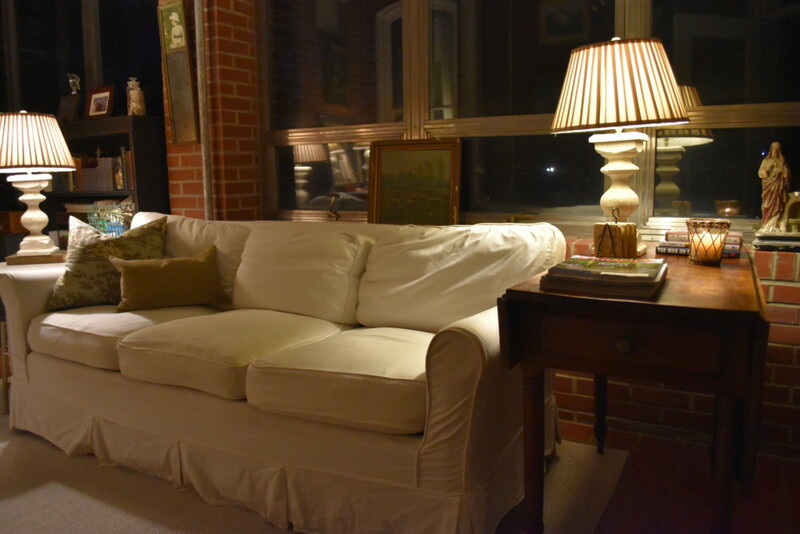 This sofa, and the one that sits opposite it are both down-cushioned, high-end sofas found at second-hand stores. The white slip-covers are actually super easy and practical. I throw them in the wash every few months with plenty of bleach, and they come out perfect each time. This wall is actually the original northern, exterior wall of the 1889 portion of the house. My grandmother always had it lined with bookcases. I did, too, initially. But the room is narrow enough as it is, and the living portion of the space felt too tight. 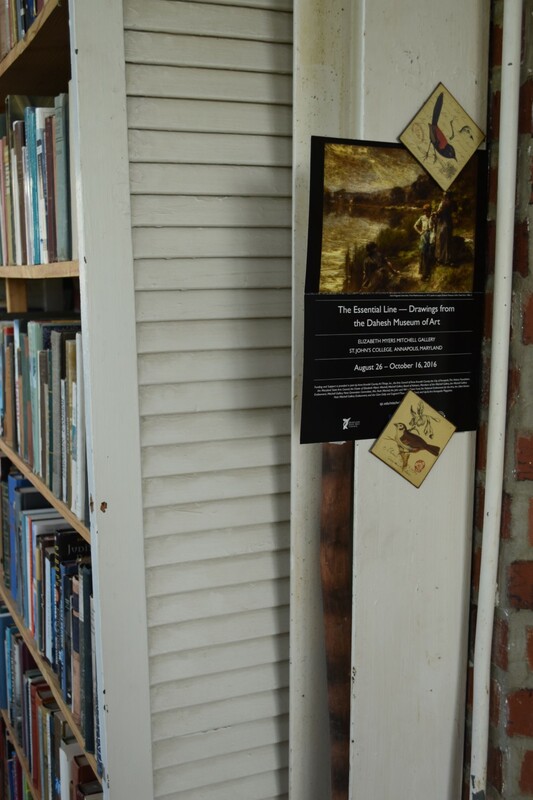 So we moved the bookcase (which Chip made out of the original shutters which had been removed from the now-internal windows) to the already too-narrow space along the old bay window, and revealed this old brick wall. Not one to leave a wall blank, I started filling it with ‘portraits’ of our farm. And then just kept adding. 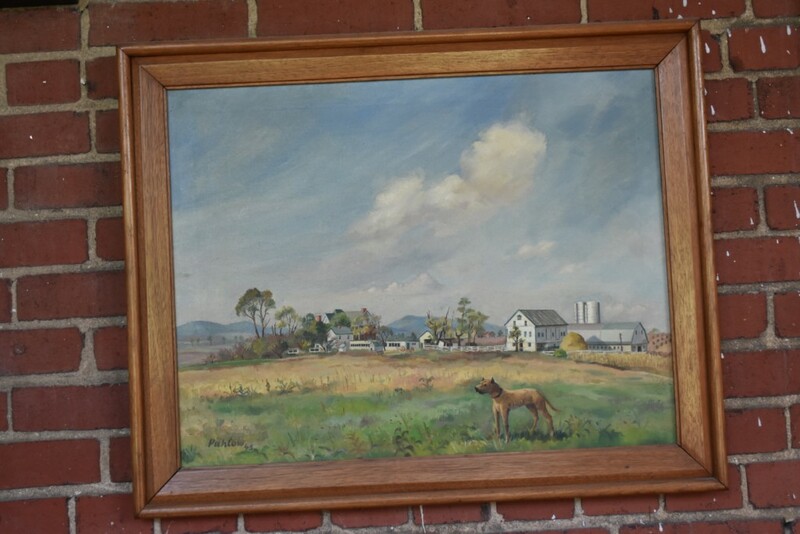 This largest, and oldest, painting of the farm was painted by Erich Pahlow, a German POW who, like hundreds of POWs housed here in Frederick County during WWII, was assigned to farm work. 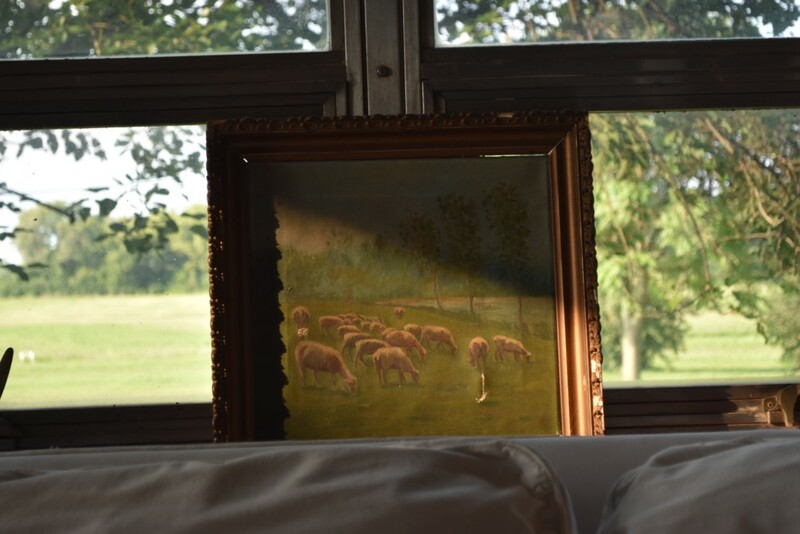 When it was realized that he was an artist, he was asked to capture the farm on canvas, rather than harvest the crops. The chicken coops are gone, as is Romulus, my grandmother’s faithful Great Dane. Other than that, the farm buildings are very much as they were then. This viewpoint is about where the soccer fields are now. These are two original oils I picked up at flea markets. 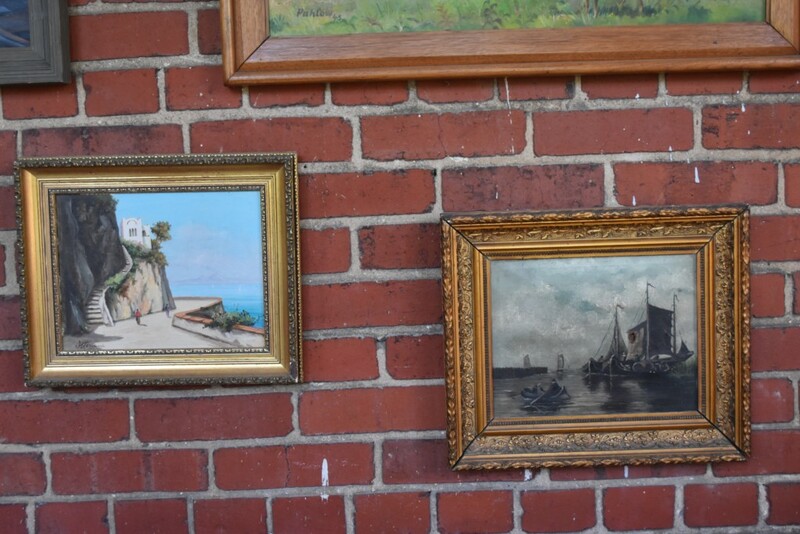 The one on the left, depicting an Italian seaside, was found here in Frederick. The one on the right is Flemish and was found in Belgium. I love both as they depict such different moods of the sky and water. 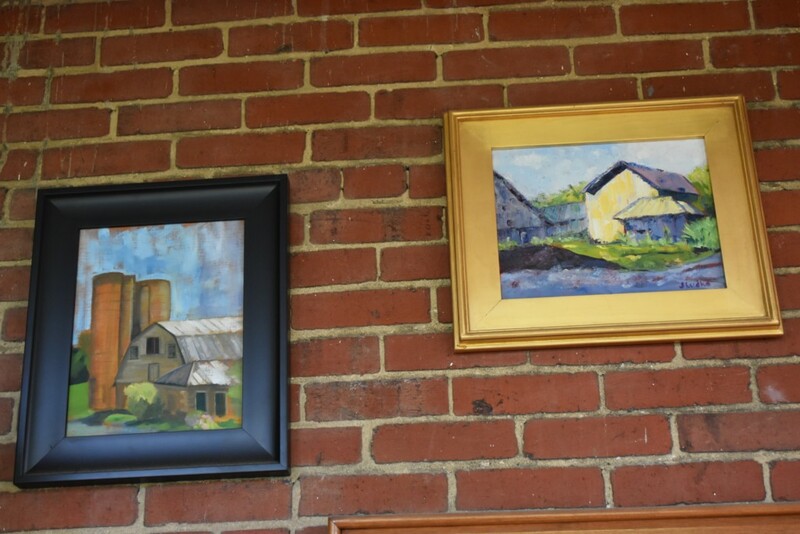 These two images of our barns were painted en plein aire during the 2010 Barnstormers tour. The Barnstormers Tour is held every year in June and includes tours of 8-10 barns in a specific region of the county. We were included that year, and had the pleasure of hosting local artists who spent the day painting our farm. 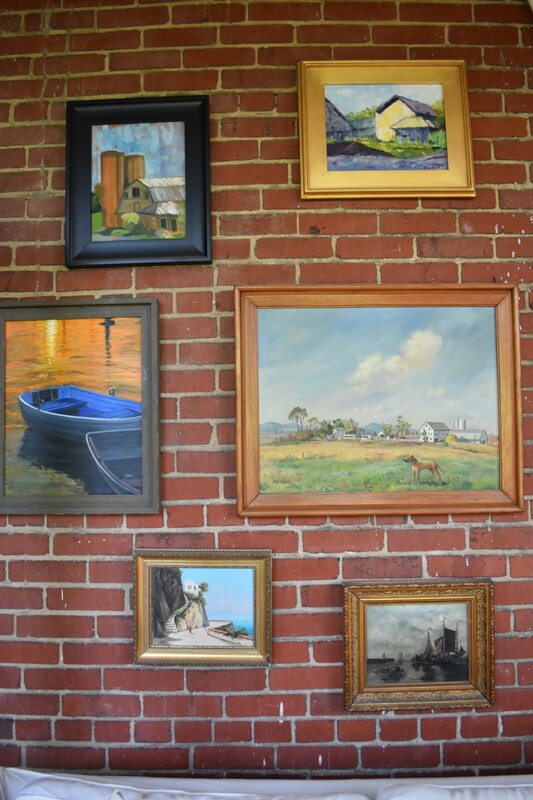 This newest member of our collection is by Nancy Smith, formerly of Maryland, and depicts a scene from the Eastern Shore, one of our favorite places to visit. 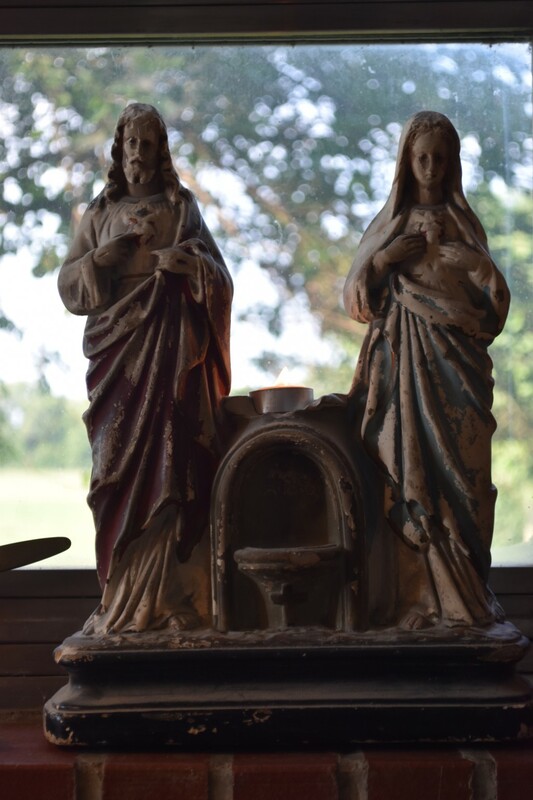 This statue of St Therese is my first larger saint statue. 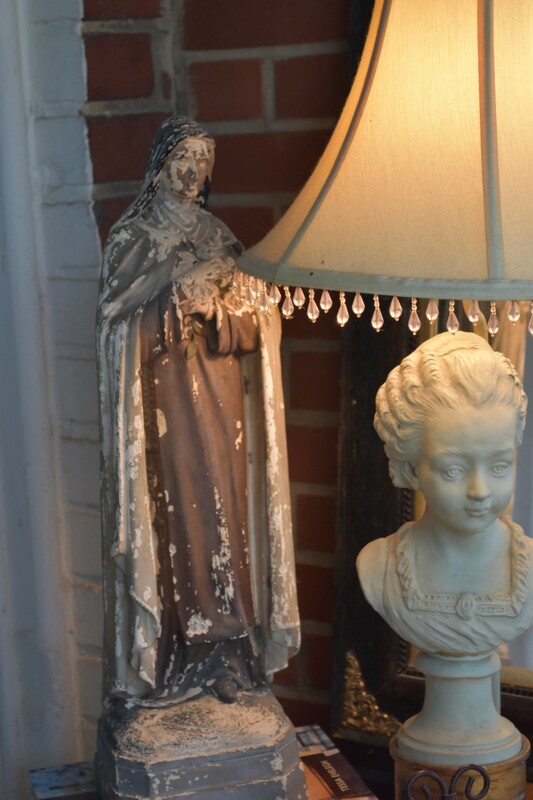 I got it from Tuscany Designs over 10 years ago, and just love the way she is weathered. 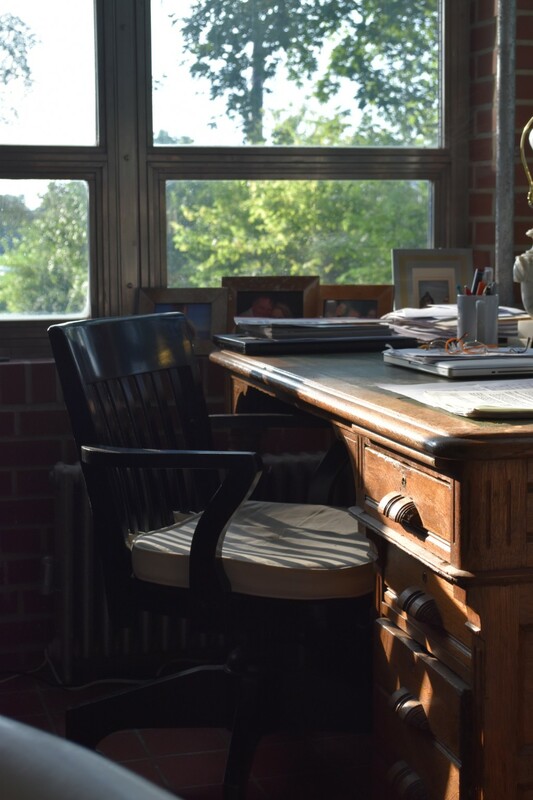 If you continue past the sofas and side tables, Chip has his desk at the very end of the room. Yes, he gets the corner office. Chip’s office is tucked neatly away at the end of the room. From this vantage point he can see over most of the property, and feel like he’s outside. The chair is from Pottery Barn. 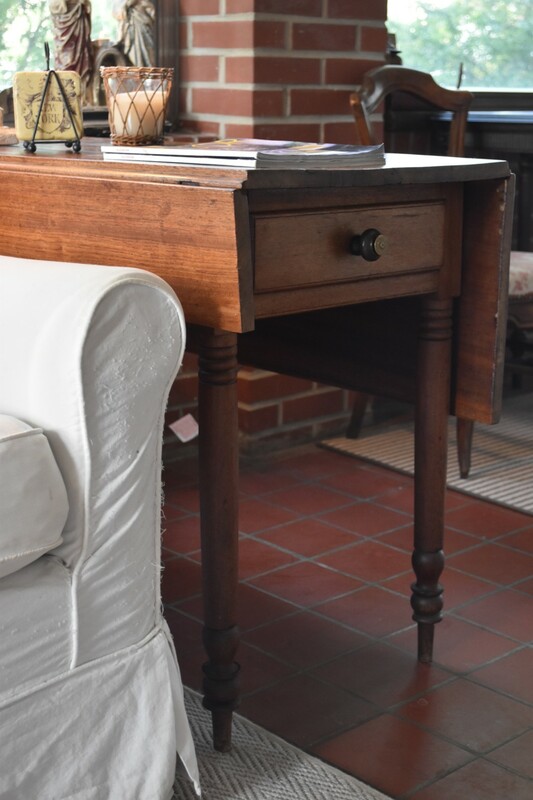 The desk is 19thC, probably English, with it’s original leather top. Here’s yet another quirky detail of our home. This is the only working fireplace in the house. 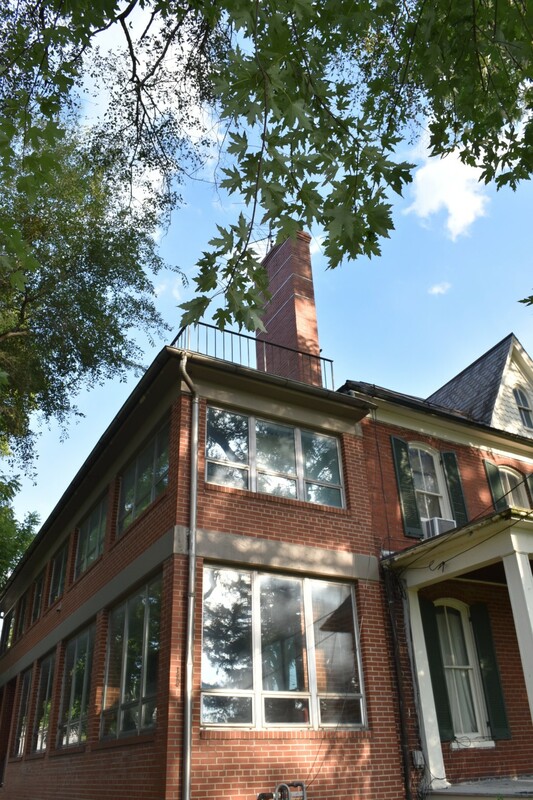 If you look at exterior shots of the house, you’ll see that the chimney for this fireplace is one of the defining features of the roofline. Yet the fireplace is so deeply built that the width of the room shrinks to about 8′ here. Chip’s desk chair is just outside this picture. 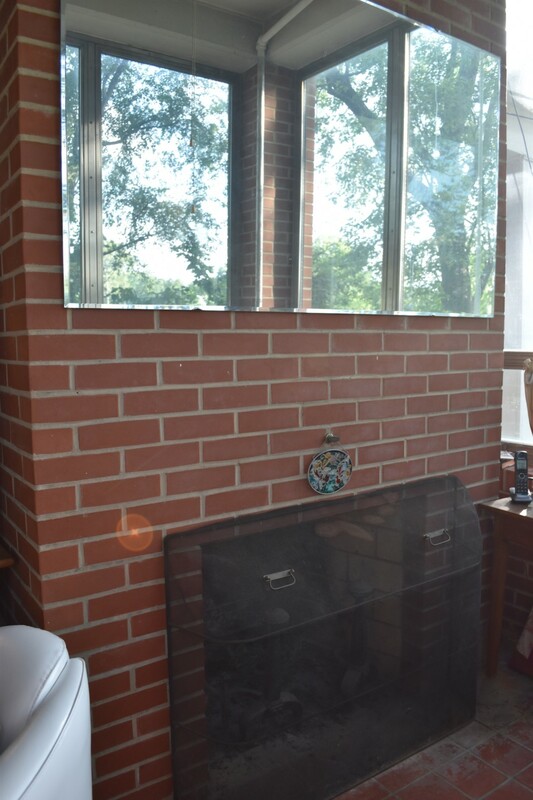 There is no way anyone could enjoy a fire from this fireplace. The large mirror was cut and installed specifically for this spot. It does serve to visually widen the space, so we’ve left it in place. You can see here the difference between the old brick (from the art wall) and this new, circa 1968 brick. Coming back around to the seating area of the room, here’s the other slip-covered sofa, with its stunning windows as a back drop. You just never know where you might find something. A year or so ago, I got a call from someone who was clearing out her family home and wanted to know if I bought things. I said I did, and she told me her name and where she lived. Only then did I realize I was talking to a cousin! 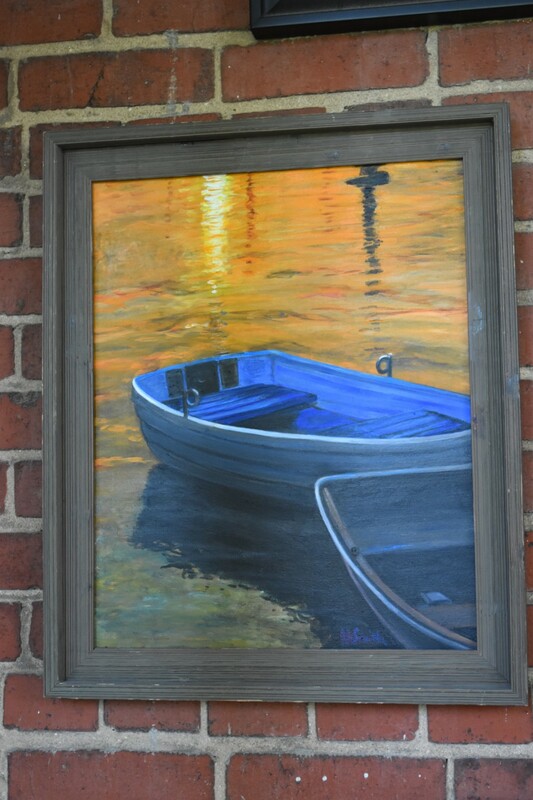 This painting was among the things she had. Her grandmother was my great-grandmother’s sister. And this painting was painted by her. It’s a little worse for the wear, but I was so delighted to see her and find this treasure! 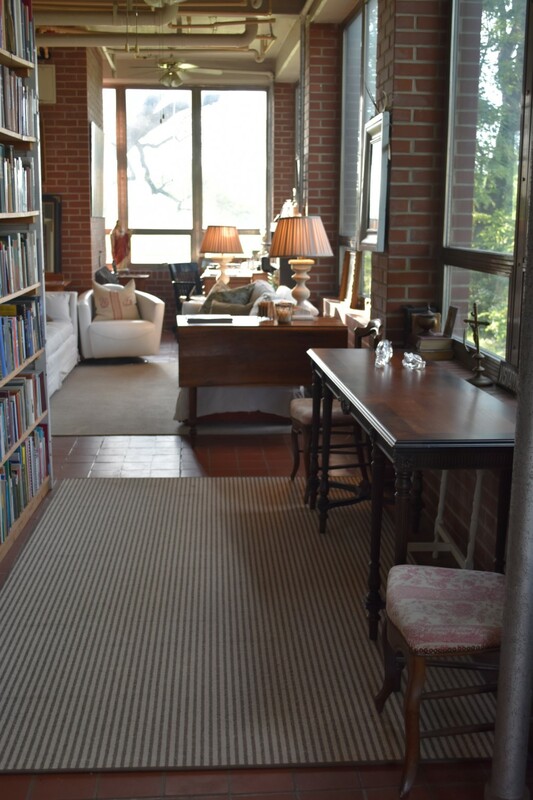 Not many things can fit on the narrow, brick supports of this room. 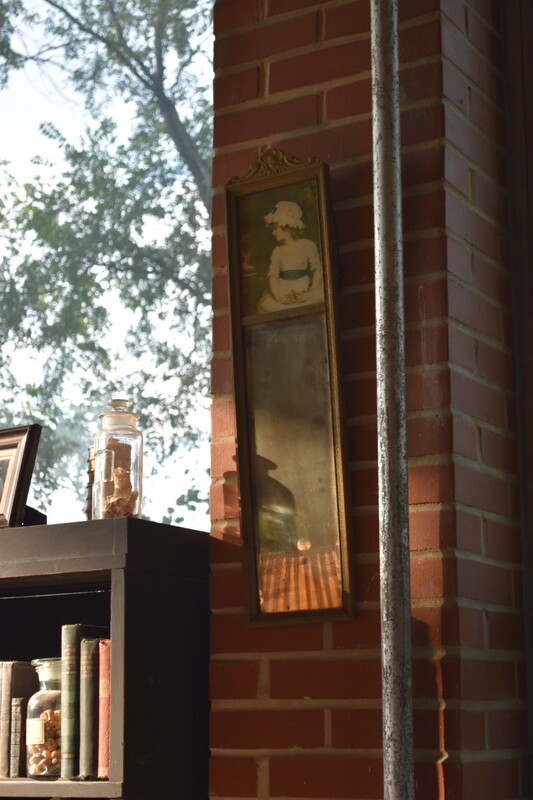 This little mirror originally hung in Chip’s grandmother’s house, and fits nicely here. 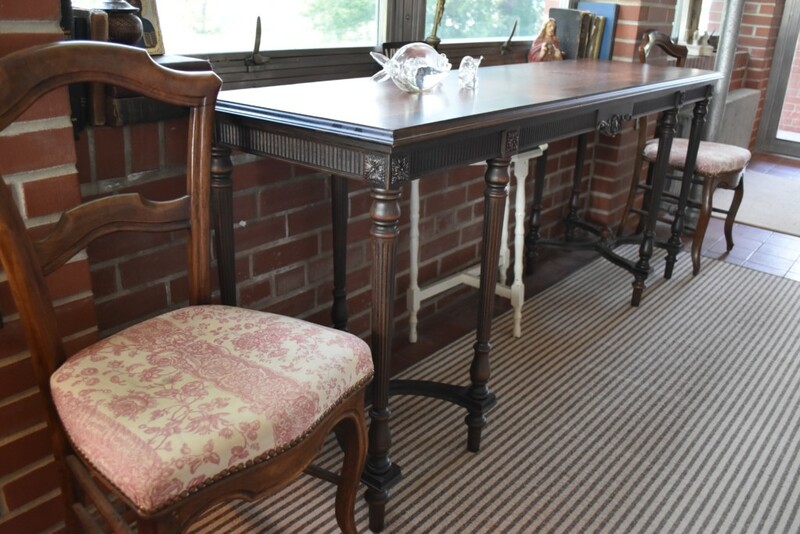 I love drop leaf tables. They are extremely versatile, usually attractive, and super convenient. This one was my grandmother’s and it’s home was always in this room. It has pretty details on the turned legs and a sweet knob. If you look closely, you’ll see that it’s missing half a leaf (I had it for years next to a radiator, and apparently it began to crack. One day we heard a “Crack!” “Bang!”, and half the leaf had fallen to the floor. You see how I deal with such issues….) The opposite leaf is in tact and we use it to expand the table for tea and cocktails. This drawer is the reason I always loved this table. Grandmother kept it filled with games and cards. 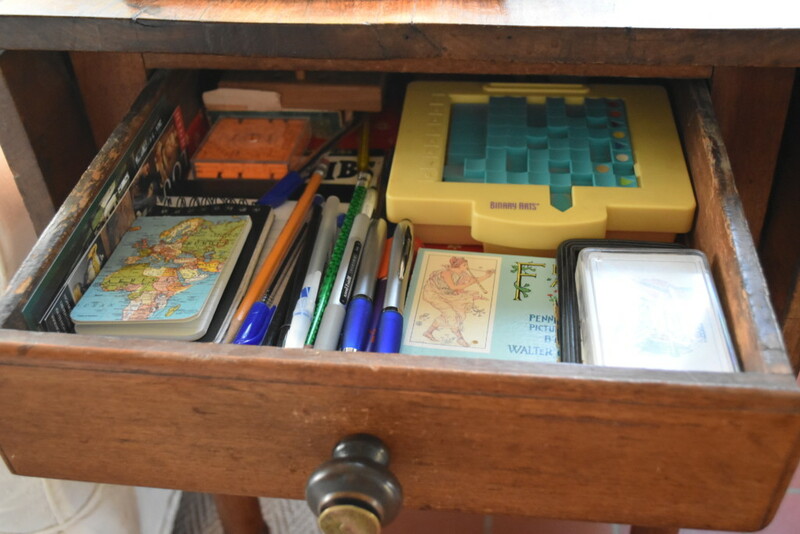 Some of the items in here are from her, but most are our own interpretation of her game drawer. Mad Libs, pens and paper, and quirky games found at The Kite Loft over the years. It’s still a fun drawer. See how great these tables are?! Also note the floor. It’s Mexican tile, and my grandfather thought it the bee’s knees. While aesthetically I’m not a fan, I can tell you that it’s THE BEST floor – ever – for playing jacks. My sisters and I would spend hours on this floor playing. It was just never the same on the wood floors at home. A gift from Tuscany Designs. I just love those guys! Turning back toward the glass door at the end of the room, here’s a better look at the long table and side chairs you saw as you entered. This table was my grandmother’s, and we always called it the black table. I recently had it redone, specifically requesting that it maintain its black hue. 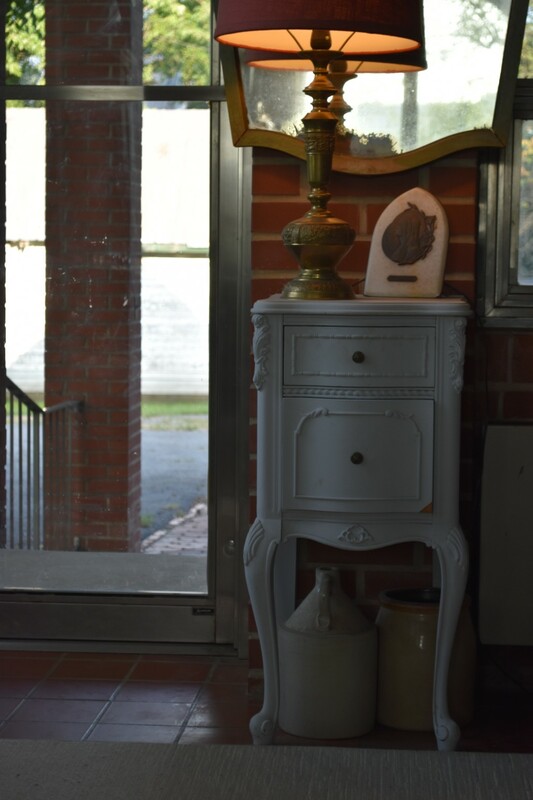 But when the refinisher saw how beautiful the wood was, he didn’t go dark, but let the natural tones show through. 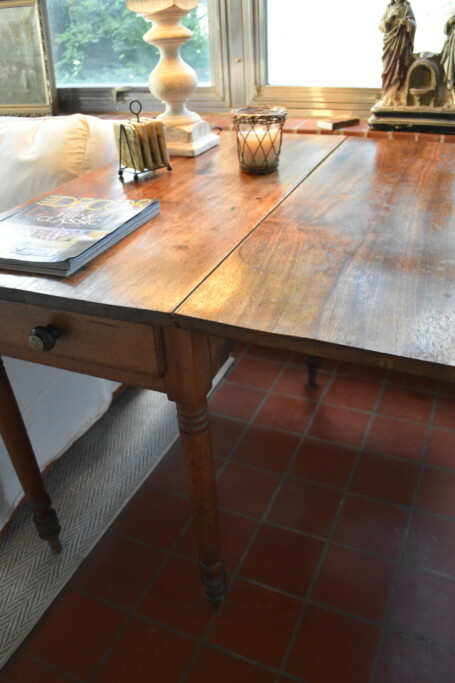 He said that the finishes they used in the 20s, when this table was made, turned black fairly quickly, hence my believing it was a black finish, but that originally it was this more subtle look. The chairs are from BB Home. We were all doing the Luckett’s Spring Fair about eight years ago, and they brought these chairs in. I fell in love, but decided I would only get them if they were still there at the end of the show. Fortunately they were, and I’ve showcased them here ever since. Again, at the door, we’re faced with the narrow support as the wall. I ignored the width of it for the mirror (one we used when we did the Lucketts Design House about 10 years ago). This little table makes me so happy! It’s the perfect size. And the genie-lamp on it is just fun. The crocks under it are from Chip’s mom. Chip made the bookcase from the tall, arch-top shutters we found in the basement. They were the shutters removed from the now-internal windows that look from the main part of the house into the glass room. Here’s a tip if you happen to have steel I-beams in your home: they make great magnet boards! Whenever there’s an art exhibit, or show of some sort I want to be sure to remember (and let the rest of the family know about) I post it here on the I-beam. That bit of wood tucked into the beam is a walking stick. Grandmother was an avid walker, and she always kept walking sticks in this beam. She loved to walk the property here at Clifton and take long ambles down to the river. She used to try to get us (my cousin, sisters, and I) to use them, but when you’re a kid, the stick just seemed to be a hindrance. Now that I’m older, I appreciate them. 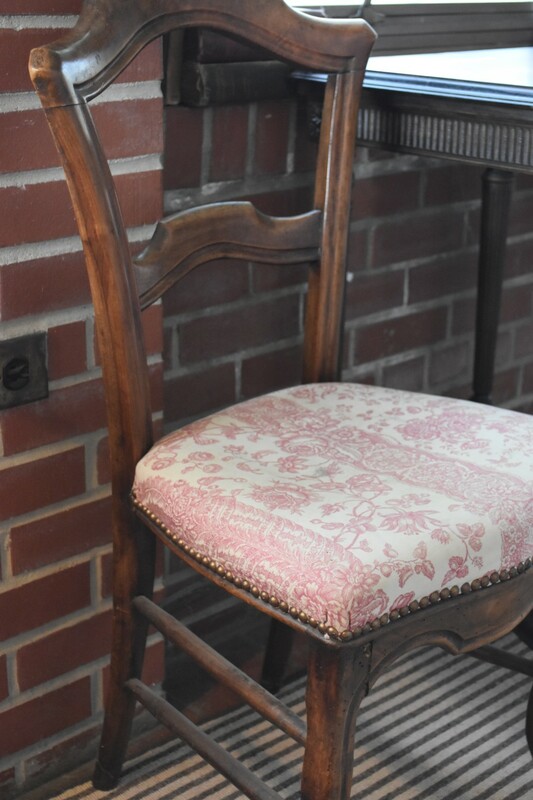 A detail of my little French chairs. This small part of my grandmother’s Steuben collection is all aquatic, a nod to the family business, Lilypons Water Gardens. 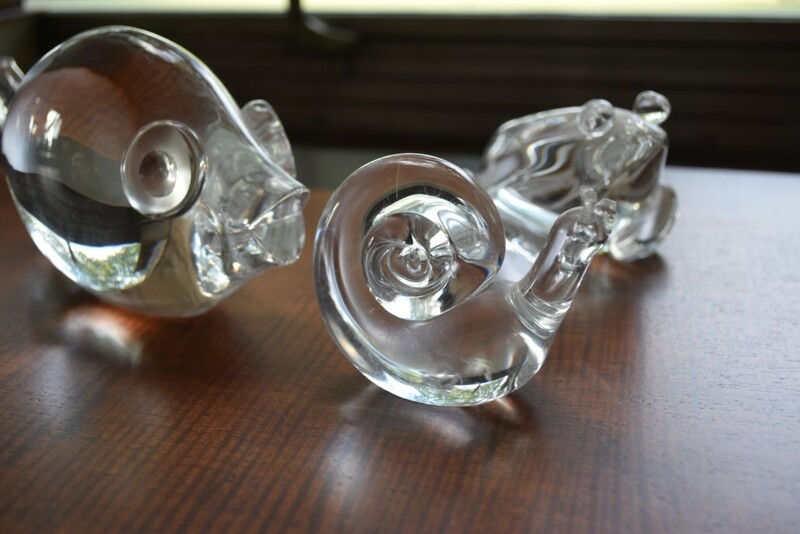 The frog has been glued and the snail is missing an antenna, but I love them anyway. They make me think of her, and the glass contrasts with that beautiful wood in the long table so nicely. While at the great Round Top Antique Week in Texas, I came upon these church cards. Each one was a different feast day: Epiphany, Visitation, Easter, etc. This one I particularly like, and put on display, because it has special meaning for our family. My mother attended Visitation school here in Frederick. Chip and I were married in the chapel there, and our girls attended elementary school there. We met life-long friends there, and found spiritual nourishment there. So I keep this humble sign I found half a continent away, to remind me. As pleasant as this room is during the day, it’s at night that it really comes alive. 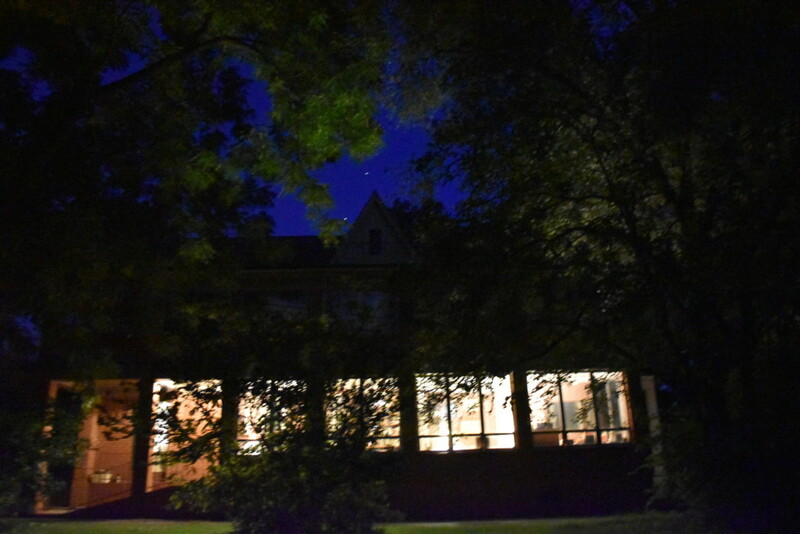 Those lights you see through the middle window are a car traveling south on Buckeystown Pike. I just love the coziness of this room at night. If it’s storming, the room is spectacular! I apologize for the quality of this photo, but I just wanted to share it to give you a sense of how welcoming this space is at night. I like to leave a few lights on in the Glass Room, so that everyone is greeted cheerily as they pop over the hill on Buckeystown Pike. Here’s a closer few of the room at night. 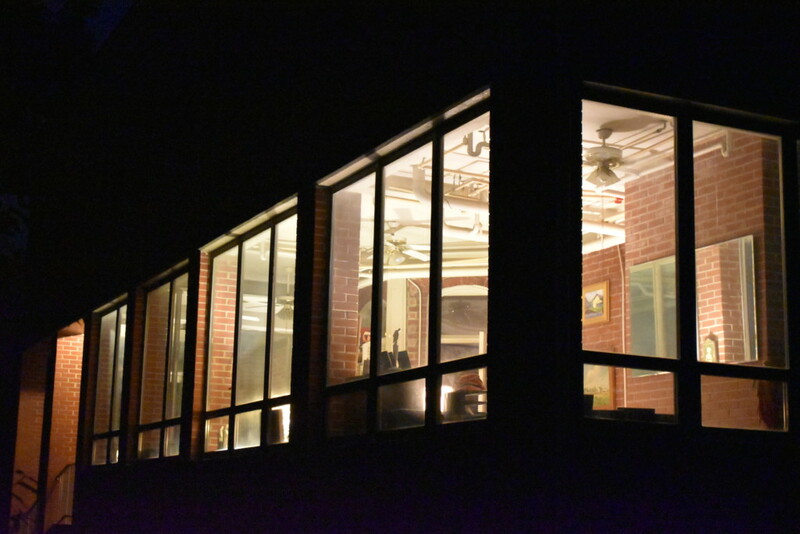 This shot really shows off the architecture of the addition and the drama of the space at night. And this is the way we’re greeted as we come home. We call our kitty, Boo, the puppy cat. 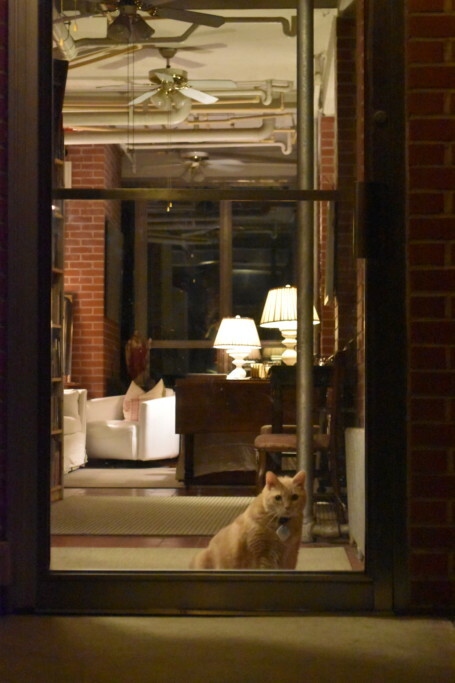 He waits for us just like this whenever one (or all) of us is out at night. I just stepped out for a few minutes to snap these pictures, and he came right to the door to wait till I returned. Of all the living spaces inside our home, this one gets the most use. 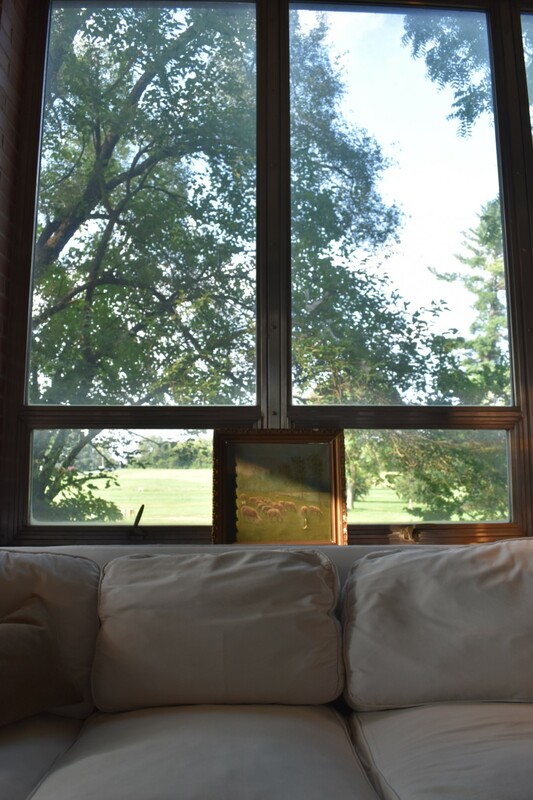 It’s the brightest, most comfortable, and never fails to give the sense that you’re part of the nature just the other side of the spectacular windows. I hope you enjoyed peaking inside this distinctive space. Next up: The Kitchen, Saturday, September 10. I have a surprise for you next Saturday, September 3. Stay tuned! Would love to know where you got your slip covers. I have a couch with the exact layout, three cushions and three separate back cushions and I’m having a devil of a time finding white, shabby chic slip covers for it. The room looks fabulous, I love all the inspirations for decorating my own place. See you at the next barn sale. The third weekend of every month is always my favorite! When visiting Chartreuse I’ve been wondering what that intriguing glass room was all about. Love it. Me, too, Erin! It always brings a piece to life for me to know something of its past. Love the history because it’s my life too! I loved this Virginia. Thank you for sharing. Actually Cousin Charlie shared on FB. I remember the Erich Pahlow painting. I know Rommy was a good dog, but when I was little, he was so big, he scared me when he wanted only to be playful. I liked him, but better at a distance.